I was thinking, since the USDA hardiness maps only measure the minimum average temperatures for only a period of time, it would seem like the post 1980’s hardiness maps of the Southeast make everything seem colder than it really is. For example, in the earliest maps created in the 40’s and 60’s, zone 8 extends much further inland in the Southeast. 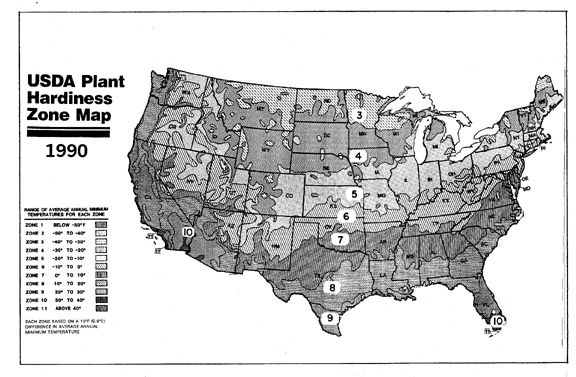 But in the post 1980’s maps, climates that were originally labeled as zone 8 became either 7a or 7b. Even in Florida, most of the state from Orlando and south had originally a zone 10 climate (zones 11+ didn’t exist yet) so it explains how royal palms had a much more extensive range father north up the Florida peninsula. Well, the 80s did happen. Might it be fair to say the older maps simply overestimated the climate? All those maps show the same story for us just in increasing detail over the years. Interesting historical summary of the flawed USDA system presentation of climate. 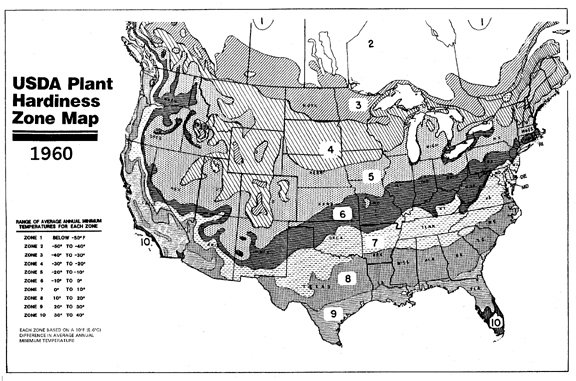 I understand that originally the USDA used maps based upon Koppen, which delivers a much more accurate summary of climate and “what grows” in a particular area. I believe that the Sunset maps incorporate the Koppen system, as modified, for the creation of the best mapping system I have seen. It originally covered only the Western states but was expanded to cover the entire US. You should take a look at it! Sunset is amazing for the West, but it’s not as detailed in the east. Still good, though. I like the 1960 map the best overall. I agree, the older maps are very simplified. I can’t imagine anywhere west of Charlotte to be a zone 8. I am not a big fan of the Koppen classification. It isn’t detailed enough. Like how can Orlando and New York both be classified as the same climate? I did not realize Koppen classified NY and Orlando in the same designation and that is my bad! I know Koppen has been modified and material I reviewed may have been the modified Koppen. The expanded Sunset is still far superior (I say that guardedly based upon Yunder’s learned comments!) 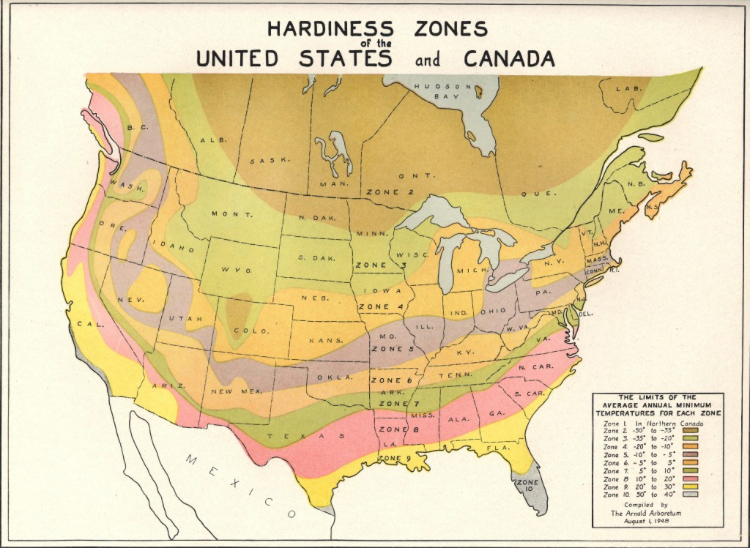 because it clearly adds the “heat” component that is totally missed by USDA ( 40F year round= Zone 11?). One only needs to observe the Tropical designation assigned to areas that the minimum medium temperature in the coldest month must be not less than 64F. Draw your Coconut Maps around this criteria! This is the most recent map of Koppen. 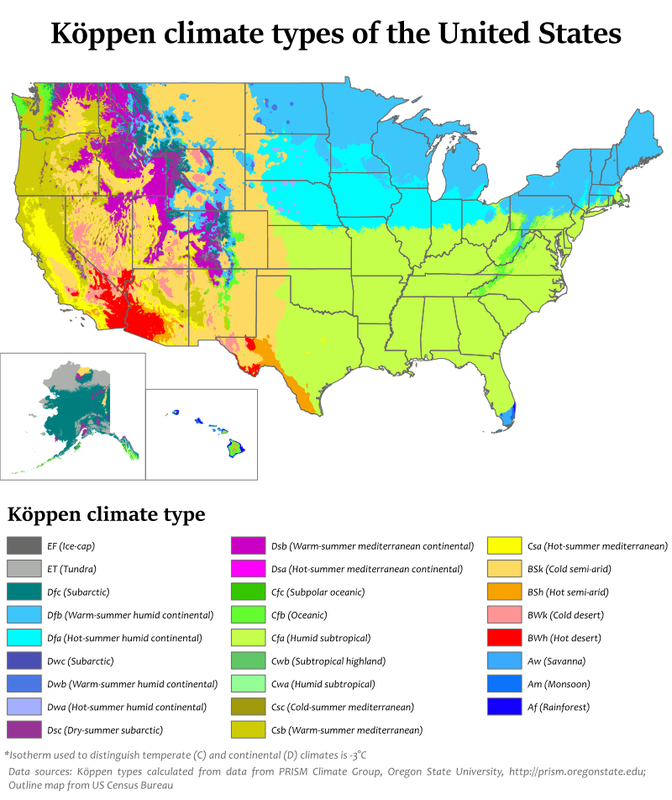 I personally define humid subtropical to be the climate of the southeastern coastal plain from the Delmarvasouth to Texas, half the places considered subtropical are just temperate climates. I lived in Southern Pennsylvania for quite some time, and that is far from subtropical. Greenville is considered borderline 31/32 on the Sunset map. I find zone 32 to be a little broad but zone 31 seems reasonable. My opinion on US humid subtropic is if southern yellow pines (outside of shortleaf) are native and reproduce freely. Loblolly requirements are fairly close to the fringe of Köppens CFa climate. But I totally understand why some folks dont like that definition. I just feel that Sunset doesn’t capture the same level of detail in FL as it does in CA, where it is amazingly (almost frustratingly) accurate. It is so careful with elevation changes, but it doesn’t seem as sensitive to the subtle body-of-water-proximity gradients in FL which explain an aged tall coconut in Pahokee and freeze survivors on Brevard’s Barrier Island, small lakes between Okeechobee and Orlando, etc. Sunset is still probably the best around (other than specialty maps made by local FL growers or biologists). I consider anywhere that Southern yellow pines dominate to be subtropical. These pine flatwoods and bottomland cypress forest have a distinct climate and ecology compared to the more temperate deciduous forest. Climate is a spectrum, and the ranges of pines best describe it. In Maryland and the Delmarva, Loblolly pines dominate the drier sites where wildfires occur, yet deciduous forest are reserved to wetter sites. Throughout the entire biome, wetter sites are still dominated by cypress, which is a deciduous conifer. Longleaf pine flatwoods replace the loblolly majority flatwoods in Southern Virginia, where these species start to grow amongst each other. Farther south, you'll start to see slash pine, sand pine and spruce pines coexist within the flatwoods, alongside the longleafs and loblollies. It isn't until you get to Florida when longleaf pines and loblolly pines are completely replaced by sand pines and slash pines. Florida is also where the subtropical coniferous forest transitions to the tropical broadleaf forest. It is pretty hard today to really understand how vast pine flatwoods really were. Before Europeans came to America, one giant flatwood covered the Southeast from Maryland/Delaware down to Florida and far west to East Texas. Now, these ecosystems are critically endangered and have been taken over by deciduous forest due to the lack of fire. Lots of good information! I too always wonder what the pine would have looked like pre settlement. According to 5 or 10 years ago loblolly alone is 12-15%+ of ALL of our states trees. 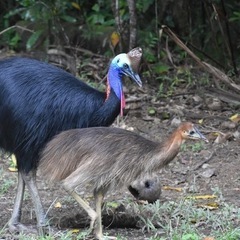 Doesnt seem like alot until you factor in the bio diversity. Delmarva is solid CFA with about the same frost free days as waaaaay far south. I still consider where I live to be a solid, albeit on the colder side, of CFA purely because of the pines being endemic and freely reproducing. But they are far from the dominatiing tree in this area....for now. I have always though on "ninja" planting them and hardy palms all over Maryland and making that be my legacy outside of kids. But for now my property will just have to do lol! I have SERIOUSLY considered trying a slash or 2 just to see what happens as I have seen they can go down to z7 and if I put them in a more sheltered spot who knows. But longleaf and loblolly already have spots picked out as do my scrub palms. You could get loblolly pine seeds and toss them around. They germinate quickly here and are almost weeds. Or you could ask local parks if you could plant one. Maybe you could replace them with invasive plants like Tree of Heavens. They grow Slash pines here as ornamentals. So I guess that they’ll be fine in Maryland. Maybe just place it on the south side of the house. I am in complete zone denial lol. I currently live in an apartment with a very small yard, which is constantly a zone warmer because of all the cement, facing southeast, and surrounded by a fence. So i’m growing 8b plants like Phoenix and Washingtonias with little to no problems while everywhere else is struggling to keep Butias alive. Well, according to the first zone map, I am in a soild zone 8. I wish... But I am able to make a cooler 8a microclimate. The first map keeps me in z8 but puts me less than 30 miles away from z9. I doubt it was ever that warm here in the last few centuries. Probably before the last mini ice age it was that warm. If only we had a very tall mountain range blocking us from cold snaps, I am sure if that were the case the beaches in the Carolinas could possibly pull off a coconut here or there! We can only wish. It’s unfortunate that we live in the only place that is getting colder while everywhere else is warming at unsustainable rates. It would be a dream to grow Bismarkias here - probably one of my favorite palms.